The King’s Bath lies at the heart of the Pump Room complex in Bath, built over and around the hot water rising up from the King’s Spring below. It will be cleaned and repaired over the coming weeks as part of a programme of ongoing care and conservation of the historic fabric at the site. Although small, the King’s Bath is made up of building elements from several different periods, each of which equates to a significant part of the story of the development of Bath as a spa city. It includes remains that are Roman, medieval, Georgian, Victorian and even from the 20th century. 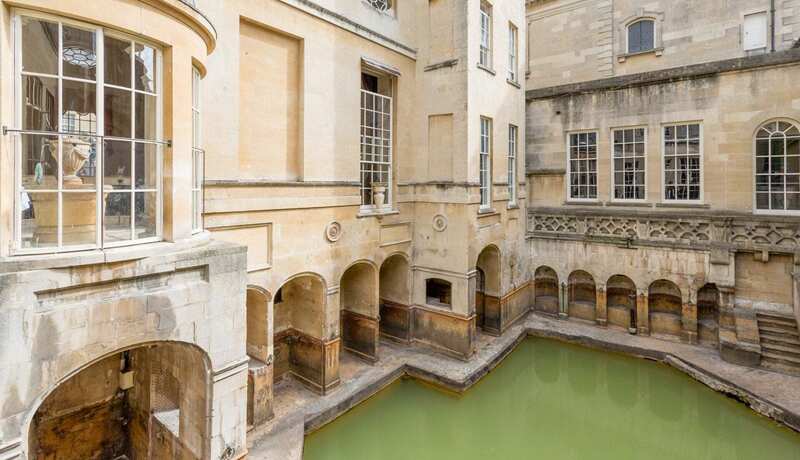 Scaffolding platforms spanning the bath will let conservators reach the historic stonework built around the largest of Bath’s three hot springs. Visitors will be able to see the work taking place through windows from the Roman Baths and the Pump Room. The conservators, from Cliveden Conservation, will employ a range of proven techniques to protect the stonework. They will remove moss and small plants and use traditional lime mortar to fill any open joints in the stonework. This will prevent water seeping between the stones and stop plants from returning. Some of the surface cleaning of the stonework will be done with steam. The schedule of works has been approved by Historic England. The King’s Bath was built around its hot spring in the 12th century on the foundations of an earlier, Roman, building. The bath provided niches for bathers to sit in, immersed up to their necks in water. On the south side of the bath is a seat known as the Master of the Baths chair, which was donated in the 17th century. Although modified during the building of the Grand Pump Room in the 18th century and subsequent 19th century developments, the King’s Bath continued in use for curative bathing until the middle of the 20th century. The bath is overlooked by a statue of King Bladud, the mythical discoverer of the hot waters and founder of the City of Bath. The Roman Baths and Pump Room will remain open as usual during the conservation work, and the rest of the site will not be affected by it.